Some parents would say that looking after four youngsters is hard enough. But after giving birth to four kittens in a chicken pen, a stray tabby cat has become an unlikely surrogate mother - to a clutch of hen's eggs. 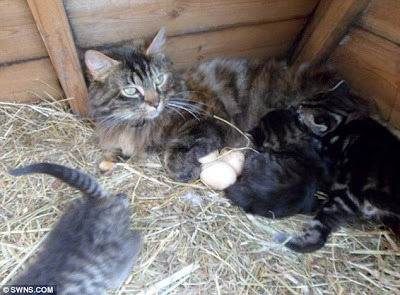 Lizzy the cat has made herself at home in the pen and now takes turns with the mother hen to look after the unborn chicks by keeping the eggs warm. Similarly, the hen keeps an eye on the kittens when Lizzy goes out on the prowl. The bizarre babysitting arrangements have delighted children at Weston St Mary's School in Spalding, Lincolnshire, where the pen is supervised by teaching assistants. Staff believe the unlikely deal allows both mothers to go out to get food. But whether the arrangements will continue after the eggs have hatched remains to be seen. 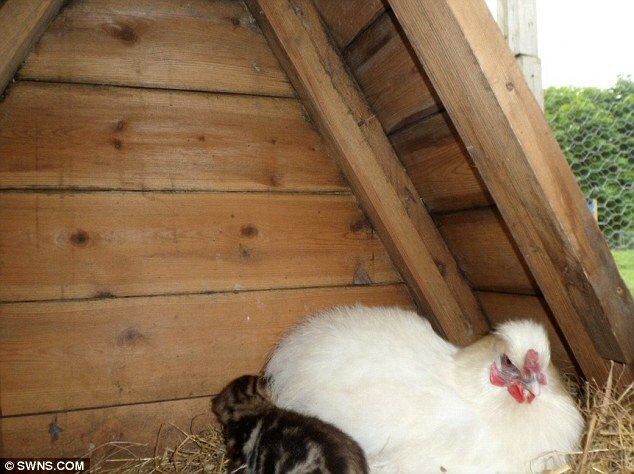 Angie Bradshaw, 48, the teaching assistant responsible for the school's pets, said the cat and chicken's relationship was 'fascinating'. The mum-of-four said: "One morning I came in and the cat had had kittens in one of the chicken pens. 'Then I came in the next day and she'd moved them in with the cockerel and hen. 'We couldn't believe it when we saw the cat lying on the chicken's eggs to keep them warm. 'It is fascinating to see the two of them together. It is like they have communicated somehow and come up with a nanny share idea. 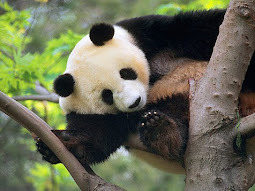 'They take it in turns looking after each other's young. 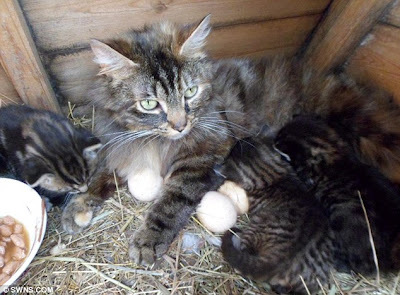 When the chicken goes out the cat moves her kittens and they all sit on the eggs. 'The cat was quite nasty at first, but now she is friendly. We are going to have her neutered and look after her. 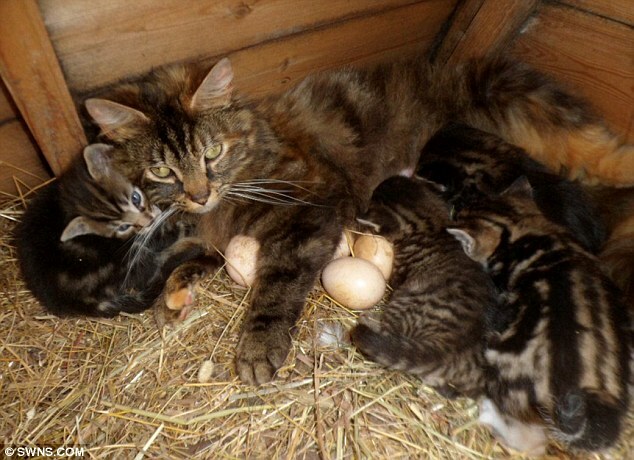 'The kittens are beautiful and all the staff and pupils are very excited about the little chicks hatching.